In this category “Kumpel” you can find matching own designer personalised leather dog leashes. 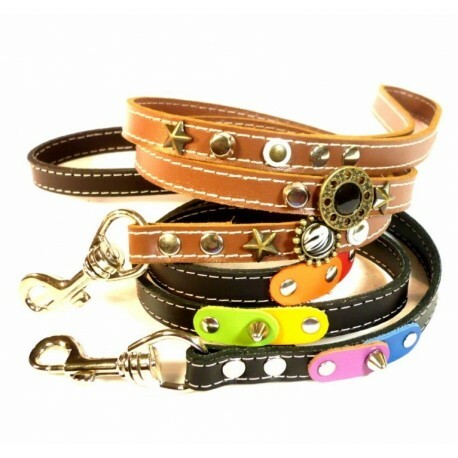 They are especially designed for these breeds and have an extra area wide on the collar to protect the neck. All my custom dog leashes are unique and made from the highest quality Spanish leather and ornaments. Superpipapo designs and manufactures all models itself. You always will find a broad selection of designs of dog leashes for all tastes! If you cannot find anything right now, please visit me again! All leashes match with the collars and also with the leather bracelets I make to size in the category “Azahar” or the special “Kumpel” ones that have a clasp.